Social media continues to dominate our digital time and attention, as over 75% of Americans now belong to one or more social media platform, and social media accounts for nearly one-third of all time spent online. One of the key reasons we're using social media is because of the benefits it affords us in terms of being connected to brands that we love and staying up to date on the latest products, offers, and other developments. As part of our POPSUGAR Future of Retail Experiences study, we asked women to tell us why they choose to follow retail apparel brands via social media. Overall, 71% of millennial women we surveyed said that they follow a retailer or apparel brand via social media. 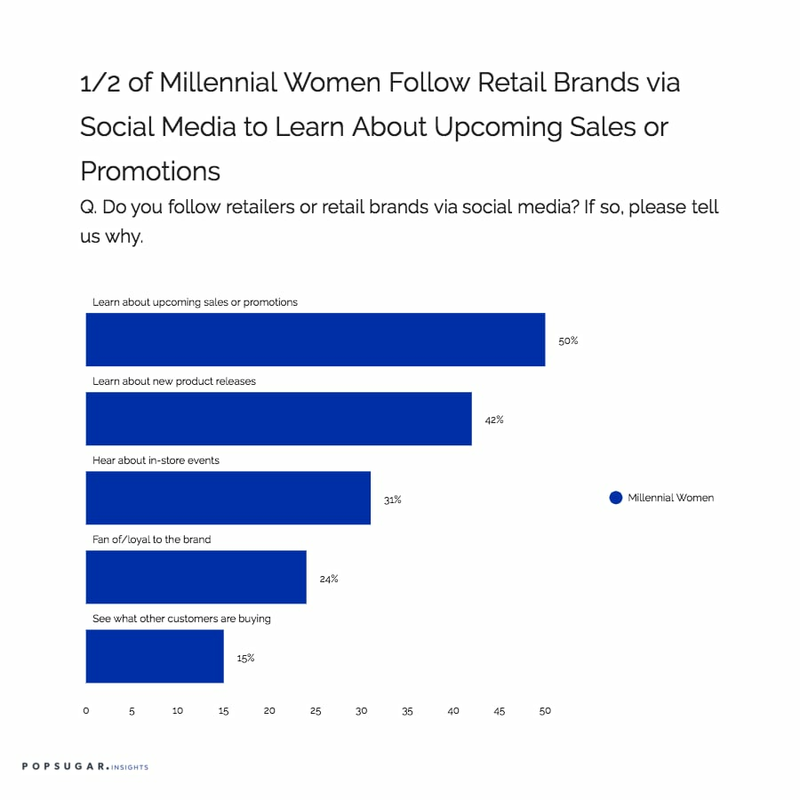 The reasons millennial women choose to follow brands via social media differ, with one-half of women wishing to be among the first to learn about upcoming sales or promotions and others wishing to learn about new product releases (42%) or hear about in-store events (31%). Over one in four social followers say they follow just because they're a fan of or loyal to the brand (24%), and 15% of respondents said they follow to see what other customers are purchasing. Millennial women are 14% more likely to follow brands to learn about upcoming sales or promotions and 17% more likely to follow in order to learn about new product releases.